Mick Box has been the lead guitarist of Uriah Heep since the band’s founding in 1969. If my math is correct, that’s 39 years ago. The group, rightfully referred to as both classic rock and heavy metal pioneers, was one of the first to use overdriven Hammond organ as part of their big sound. Box’s guitar was the heaviness on the other side of the stage, however, and mixed with singer David Byron’s distinctive lyrics celebrating all things wizards and unicorns, the group attracted a large audience quickly. Max Ink: The new album sounds awesome, especially if you’re a fan of seventies rock. Tell me why our readers will dig Wake The Sleeper? Mick Box: Well it is a straight ahead classic rock CD in true Heep style. Plenty of songs full of melody and cool lyrics and played on the Hammond Organ, plenty of Wah Wah Guitar, Bass, Drums and lots of UH trademark 5 part Harmonies. It was important after this long hiatus between studio CD’s to come back letting everyone know that we still have the passion and energy that we always had for our music. I think within the first 30 seconds of the first song we pretty much do that. It was nice to come back with a CD that the fans deserved and the reaction from them and the media has been stunning. MI: There are eleven tracks on the album. Is there a favorite track for you? MB: I was pleased with the music and lyric structure of “What Kind Of God,” though “Tears of the World” has all the elements that Heep are known for. MI: Uriah Heep is as famous for keyboards - especially BIG Hammond organ - as it is guitar. Why do you think heavy organ has faded while heavy guitar lives on? MB: Well the guitar has always been there through every decade but the keyboards went from the Hammond to synthesizers to samplers and the like. It is a shame as the Hammond has all the same qualities as the guitar and is just as versatile in the right hands of course. MI: It’s great that you keep aggressive organ alive in the Uriah Heep sound. Can you tell us a little about Phil Lanzon’s setup? MB: Phil uses on the road a B3 Hammond and a Leslie cabinet. The Hammond is always used in the studio. On Wake the Sleeper, we just used the Hammond only and the piano for a small part on one song. We were determined that there would be no synthesizers or samples on this CD just Hammond Organ. Phil is an excellent Hammond player and has the ability to coax from it all the dynamics that we need for our music. MI: Keeping that sound is important. Speaking of the organ, what is your relationship with former ‘Heep organist Ken Hensley these days, if any? MB: Ken now lives in Spain and is a born-again Christian, so his life has taken a different path to mine. However, we do converse by email every now and again. MI: Over the years, you’ve had three or four singers since David Byron’s unfortunate death. How long has Bernie Shaw (current vocalist) been the singer of Uriah Heep now? MB: Since 1986, and he is now the longest serving Heep singer ever. MI: Is the current Uriah Heep lineup actually the longest lasting? MB: Well, it was until Lee Kerslakes departure due to health issues. MI: That was sad to hear about. Of all the Uriah Heep lineups, which is your favorite? MB: Impossible to answer really. I can compare the classic 70’s line up of Byron/Thain/Kerslake/Hensley/Box with today’s line-up of Shaw/Lanzon/Bolder/Box/Gilbrook regarding chemistry and creatively. MI: I’ve probably asked too many organ questions. Let’s move on to your instrument. What was your guitar/amp rig for the new album? And touring? MB: I used a 50 watt Marshall head with a 4 x 12” Cabinet (straight) for riffs and rhythm parts. I did two passes on each riff and rhythm part one with my Gibson Les Paul Black Beauty and one with my Les Paul Gibson Tobacco Sunburst. These went through a Marshall Govenor and a Cry Baby Wah Wah. For solos I used all the above with a 1959 SLP Marshall head. MI: How has digital technology changed your gear, if at all? MB: Quite the reverse - I shy away from it whenever possible. MI: Besides Wake The Sleeper, do you have a favorite Uriah Heep album and/or song? MB: The album Demons and Wizards would be right up there as that was the one that took us on to the world stage. 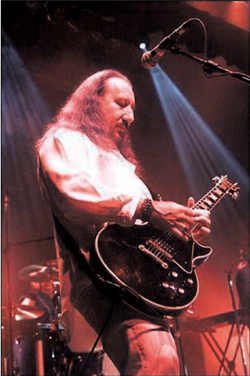 MI: As of this writing, Uriah Heep has no tour dates listed in the United States. Do you have any plans to tour here? MB: Our USA agent is looking at the possibilities of putting a tour together mid January/February 2009. We have our fingers crossed.